Boston might just be one of the prettiest cities we’ve ever set foot in. The leafy green streets of this US town are the perfect place to wind down after a hectic few days in New York City. Just a short, not to mention picturesque, train ride from the city that never sleeps, Boston is an absolute must if you happen to find yourself in that part of the world (and if you don’t, you might want to start saving your pennies and book that flight). Keep your holiday hassle free by booking as much as you can before you go. We used Expedia to book our hotel and some activites (including the Harvard University tour—because you can’t go to Boston and not see Harvard). We caught the train from New York City to Boston and trust us when we say it’s a must-do! Yes, it does take about 4 hours (compared to the 1.5-hour flight), but you don’t have to deal with airport security, traffic and checking your bag. Win. Plus, most parts of the train ride are pretty stunning. If you’re not coming from New York, there are plenty of flights from most major cities so you won’t have any problems. If you want to feel like an absolute rock star while you’re in Boston (and let’s be honest, of course you do) then book yourself in at the Four Seasons. If you’ve just come from New York, you’ll notice the rooms are about 487 times the size of your last hotel (you’ll actually be able to open your suitcase the whole way! ), plus it’s in a prime location so you’ll be able to walk your way around the city. If you’re staying at the Four Seasons you’ll probably just want to soak up all the goodness for a little while. Have a little rest in the most comfortable bed you’ll ever lay on, check out the ah-mazing pool (don’t miss the sauna) and take in the views of the Boston Public Garden. Once you’re feeling well and truly refreshed, venture out to the beautiful Boston Public Gardens and have a little walk around. 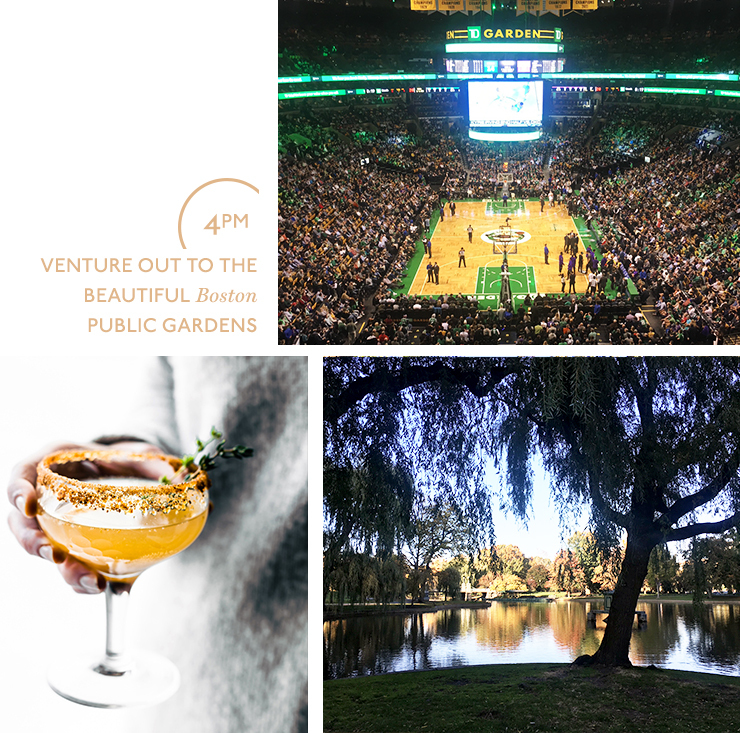 Once you’ve got your greenery fix, check out Newbury Street for some seriously good shopping, or go the other way into the Boston Common—another park that makes up part of Boston’s famous Emerald necklace—a ‘chain’ of parks that resembles a necklace hanging from the Boston Peninsula. Head to the North End and treat yourself to some epic Italian eats. We recommend walking and keeping your eye out for some of the Freedom Trail ground markers. The Freedom Trail is a 4km long trail starting at the Boston Common with 16 different markers along the ground which point out historic landmarks. You can join a daily tour if you’re really keen to learn about the history of Boston and the US, or check out this self-guided tour. It’s an early dinner tonight, but that’s because you’re about to go and get your sport on, but more about that soon. For now, get yourself a table at Antico Forno and take in all of the authentic Italian vibes. Everything at Antico Forno is seriously delicious so go hungry and then share as much as you can fit in. If you’re a wine drinker, you’ll want to take a good hard look at the wine list because it is top notch and there are a few knock out reds on the list you’ll definitely want to try. For entrees, the polpette, the eggplant parmigiana and the arancini were stand outs. To be completely honest, you’ll probably be full after those—the servings are HUGE—but you can’t stop now. The pizzas and pastas are all phenomenal, but the highlight for us was the Il Marino pizza with shrimp, bocconcini and cherry tomatoes. If there is even the slightest amount of space in your stomach for dessert, it’s a toss up between the tiramisu and the dolce pizza (just get both). Trust us, you won’t regret it. Then all that’s left to do is roll yourself over to TD Gardens for some cheap beer and allll of the sporty atmosphere. If you’re lucky enough to be in Boston while the basketball is on, you have to get tickets to a Celtics game. Even if you’re not into sports, we promise you’ll have fun, just take a seat and start cheering! The ice hockey is also pretty great to watch, even if you have zero idea how it works. A quick tip from us to you: make the most of US Sports Tickets and lock your tickets in before you leave Australia! If you have any steam left in you, it’s time to say goodbye to beer in plastic cups and hello to some of the best cocktails in Boston. Jump in a cab and head to Drink in Fort Point. Drink is a little different than your average cocktail bar in that they have no menus, just bartenders who know their shizz. All you need to do is tell them what you feel like drinking and they’ll making something 18 times better than what you felt like. These guys do Tiki Sundays on the second Sunday of every month so if your trip happens to coincide with that, you know what to do. Hopefully your head isn’t too sore after last night because there’s lots to see today! Start by making your way to the Boston Public Market which is full of local produce and yummy eats. If you’re feeling healthy, there are tasty cold pressed juices as you walk in, but if you’re in need of something more substantial, grab a coffee and then make your way around the corner and find the fresh bagels (just follow your nose). These bagels are as good as any you’ll find in New York and will hit the spot every.single.time. There’s also a pastrami shop, loads of cheese and all sorts of delicious things so if you can find time for a little picnic in the park this is where you’ll want to stock up. You’ve got a bit of free time now so you can either do some more of the Freedom Trail, have a look at the New England Holocaust Memorial (and learn a bit about it with this self-guided tour) or peruse Faneuil Hall and Quincy Market. Head to Harpoon Brewing for lunch. If you’re mad on beer, you should do the public tour which starts at 1pm. This includes about 15 minutes where you can taste as many beers as you can manage, and even if you’re not mad about beer, there are plenty of options you’ll want to try, just ask them about the combo that tastes like apple pie! 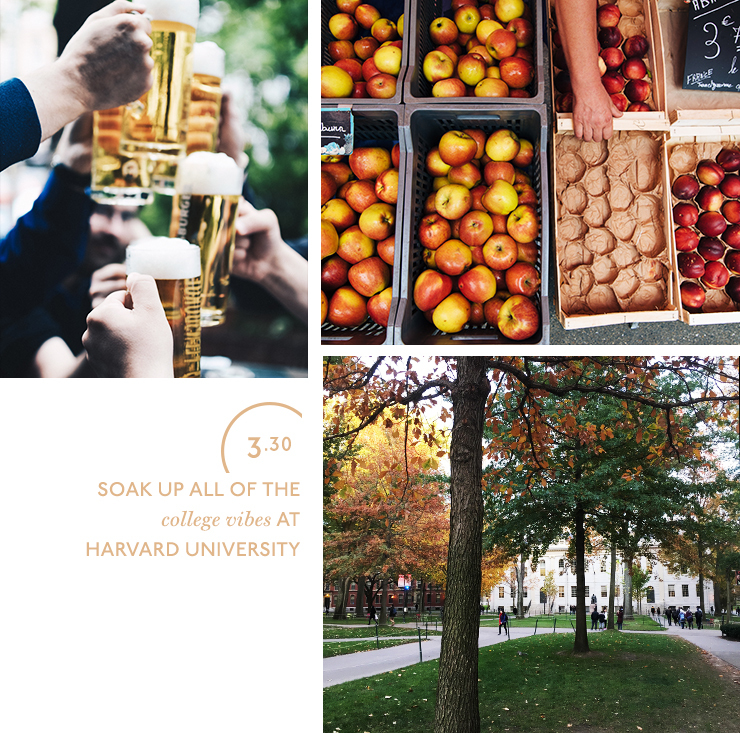 Start making your way to Cambridge to soak up all of the college vibes at Harvard University. Cambridge is an easy train ride away and when you step into the streets you’ll feel like you’re in a completely different city. Meet your Harvard Tour guide on the edge of the campus and then let them take control. With a seriously beautiful campus, some pretty fascinating history and a couple of bizarre Harvard traditions to learn about, you’ll most likely finish the tour wishing you were a student again. Stick around in Cambridge for dinner at Little Donkey. This will undoubtedly be one of the best meals you eat on your US trip. The cocktails here are ridic—don’t miss ‘the one in a grapefruit’ which literally comes in a grapefruit—and the wine list is solid. Little Donkey has an amazing raw bar with some of the best ceviche we’ve ever eaten, so you absolutely need to try some of those. We let our waiter bring out whatever they thought was best and were not disappointed. All the mains were delicious, but a couple of highlights were the matso ball ramen and the Peruvian steak shish kabob, but you can bet your bottom dollar that everything was fresh and bursting with flavour. If you can’t fit Little Donkey in for dinner on your trip, go for brunch or lunch, just don’t miss it. If you’re into jazz, you’re going to be in your element tonight. Scullers Jazz Club is probably the most well-known jazz club in Boston—it’s been around for close to 30 years after all—and they host some of the best talent going around. Take a look at the calendar and find a show you like the look of. If they don’t happen to have any shows on while you’re in town, check out Beat Brasseries which is in Harvard Square (these guys also do jazz brunches on the weekends) or the Beehive which has live music every night of the week. Start your day right at The Friendly Toast in Back Bay for breakfast. The menu is as long as your arm which isn’t surprising considering there is a whole section dedicated to benedicts, another section dedicated to pancakes and plenty of other goodies. The Friendly Toast does a dang good boozy brunch—mimosa flight anyone?—so why not have a drink… you’re on holiday after all. If you’re not too hungry and just want coffee, stop by The Thinking Cup for a seriously good cup of joe. 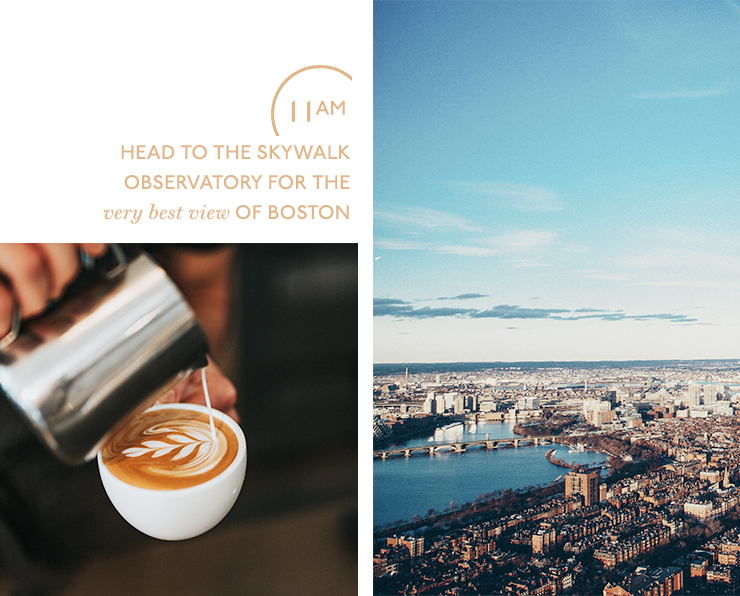 Finish up that last mimosa and head to the Skywalk Observatory for the very best view of Boston. Grab a set of headphones and learn about Boston and its history as you check out the views. If you’ve got some spare time, check out the Museum of Fine Arts—you could honestly spend an entire day walking around this gorgeous museum. If you’re pushed for time, head back towards Beacon Hill for a wander around the beautiful cobblestoned streets. Word on the street is that Acorn Street in Beacon Hill is the most photographed street in all of America! Heading to New York? Read this. Editor’s Note: The author of this article was hosted by Brand USA and Expedia in Boston, but as always, the opinions and recommendations are their own.